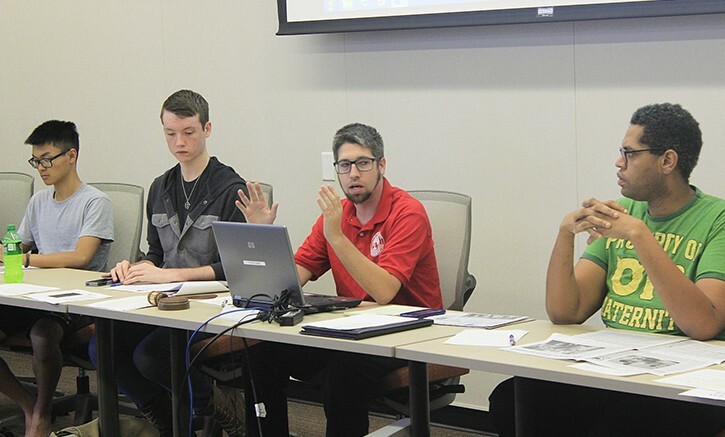 Associated Student Body Student Senate President David Hylton, center right, is able to keep his position on the board after an attempt to recall him last week failed (Photo by Jordan Schauberger). A previous version of this story falsely reported that the Folsom Lake College student government voted not to recall Los Rios Student Trustee Cameron Weaver. In fact, the Folsom Lake College student government abstained from voting but released a statement. Both Associated Student Body Student Senate President David Hylton and Los Rios Student Trustee Cameron Weaver have survived efforts to recall them from their positions this month. It was announced, prior to the Senate meeting Thursday, that although 72 percent of the students who voted in a special election on eServices wanted to remove Hylton, the required amount of 75 percent was not met. Hylton became acting president after Student Senate President Garrett Kegel and Vice President Sam Kinsey abruptly resigned at the end of September. The recall election was triggered by a petition of students requesting an election after Hylton’s comments questioning the conduct of Israel and supporting Weaver, who said he was “skeptical” about whether the Holocaust actually took place. The petition was started by Jorge Riley, who served as acting Student Senate president in the fall 2013 semester. Hylton declined to comment unless questions were emailed to him before hand. Of the 241 students who voted, 173 voted in favor of the recall and 68 voted against, according to the Center for Leadership and Development. The American River College Student Senate voted 8-2 against a proposal to recall Weaver on Oct. 15. The Sacramento City College student government had a tied vote, according to the Sac City Express. The Folsom Lake College student government chose to abstain, but released a statement which said that the group “(is) not currently satisfied with the apology provided to the Board of Trustees.” Three of the four Los Rios college student governments would have to agree to a recall for a special election to be held. During public comment during the ARC Student Senate meeting, Weaver said that he has been “misrepresented” by all of the media coverage of his comments. “Despite the fact that I’ve been completely misrepresented in ARC Current’s initial coverage as well as all the subsequent local news coverage, I recognize that this entire event has cast the district in a negative light,” said Weaver. “From the very bottom of my heart, I am truly sorry that I am the epicenter of this. Clubs and Events Board Vice President Mary Stedman said during the meeting that she did not support a Weaver recall. Be the first to comment on "ASB Notebook: Senate president and student trustee survive recall efforts"